It was the show where all the titles were defended. But did it live up to the hype? That was what I was hoping to find out by watching WWE's Night of Champions, shown live in the early hours of this past Monday morning on Sky Box Office here in Britain. The show began with the first title match of the evening as Kevin Owens challenged Ryback for the Intercontinental title. This was one of those short and sweet openers that entertained from start to finish. The big guy looked impressive early on as he threw Owens around like the proverbial cuddly toy, but when Owens rammed his man's shoulder into the ring post it changed the complexion of the match completely. Owens looked great as he worked over Ryback's left arm and shoulder, and although the champion kept coming back the big question mark remained as to whether the injury was taking it's toll on him. It proved to be the case when he went for his shellshock finisher, although he did manage to power out of an Owens armbar. But when he went for the shellshock a second time Owens countered with a good old fashioned rake of the eyes. A roll-up and a three count later and Owens was the new champion. Then it was on to chapter 237 of the on-going struggle between Dolph Ziggler and Summer Rae guy Rusev. Despite my misgivings about seeing these two against each other for the umpteenth time this proved to be a very good match, one of those knock down, drag out affairs that looked like it could go either way, until the somewhat unique ending that is. Both guys looked in top form throughout, with Rusev controlling the majority of the action and Ziggler, who seems to be taking style tips from Shawn Michaels, making spirited comebacks every now and then. But despite the fact that they threw everything they had at each other neither man could put the other away, which only served to increase the frustrations levels, especially for Summer Rae, who jumped onto the ring apron to vent her spleen as it were. She soon found herself flying over the top and into the ring when Rusev pushed Ziggler into the ropes. This didn't sit too well with the referee, who tried to send her to the back. But when she threw off her shoes in a fit of rage one of them struck Rusev. Ziggler capitalised by taking the Bulgarian down with the zigzag for the winning pin. It was back to championship action for the next match as Bubba Ray & D-Von Dudley challenged the New Day's Kofi Kingston and Big E for the Tag Team titles. This proverbial battle of the generations was another of those short and sweet encounters. The Duds brought back fond memories of their previous heyday earlier on before Bubba took the punching bag treatment as the ever-annoying Xavier Woods provided musical entertainment from ringside. Bubba eventually made it back to his corner for the hot tag, signalling the start of the all hell breaking loose segment which saw them take Kingston down with the 3D, but just when it looked like we were going to get new champions Woods jumped into the ring and broke up the pin. The referee had no choice but to call for the bell, giving the Dudleys the disqualification win but keeping the titles on the New Day. That wasn't the end of things, although the New Day boy's attempts to put the Dudleys through a table backfired when Bubba and D-Von regained their senses and sent Biggie and Kingston packing before they put Woods through the table. The title action continued with Charlotte challenging Nikki Bella for the Divas title, with the stipulation that if Bella lost by count out or disqualification she'd lose the title. The danger with this match was that they could have ended up having the same kind of match they'd had on Raw a few days before. Thankfully that didn't happen, and what we got was one of the best Divas matches I've seen in a long time. The story was quite basic. Charlotte tweaked her knee when she was pushed off the ring apron, which led to Bella dominating the majority of the match as she worked over the injured wheel. The action was extremely well-paced, with Charlotte's moments of offence few and far between. Charlotte took her chance when she took Bella out with a spear as she came down from the top rope. She immediately went for the figure eight leg lock, and it wasn't long before Bella was tapping out to give Charlotte the title-winning submission. Six man tag team action followed as Bray Wyatt, Luke Harper and new boy Braun Strowman took on Roman Reigns, Dean Ambrose, and their mystery partner, none other than Chris Jericho. A part of me wanted this to resemble the Shield/Wyatts war I reviewed recently, but then again it's probably a good thing that this was nothing like that particular match because this was a pretty decent encounter. This was actually the first time I'd seen Strowman in action, and I have to admit he looked quite good in there. His appearances where kept to a minimum, so if he does have any deficiencies then they weren't shown here, and the moves he pulled off were pretty impressive. The best part of the match was the all hell breaking loose segment, and it was here that Strowman looked his best, particularly against Reigns. It took the big man two Superman punches and a spear to finally take the newbie down, but just when it looked as if he was about to apply the finishing touches Jericho tagged himself into the match. This proved to be their team's undoing. Strowman easily blocked Jericho's code breaker attempt before squeezing the life out of him with that bear hug variation of his. There was literally no escape for the returning superstar as he passed out to give the Wyatts the win. Needless to say that the former Shield boys were none too happy with the manner of their defeat, especially when Jericho pushed past Ambrose as he left the ring. The penultimate match saw John Cena challenging Seth Rollins for the United States title. So how did Mr. Rollins do in his first outing of the night? The answer is pretty damn well. This match was certainly on a par with their Summerslam encounter. Both champion and challenger put in good performances, and I just loved the way the match played out, especially at the beginning when Rollins looked a couple of steps ahead of Cena. Of course, the best move of the night came from the champion. That sequence when Rollins took Cena down from the top rope with a superplex and holding on a floating over so he could take him down with a suplex was a thing of beauty, it really was. But one beautiful move alone doesn't win matches, and sadly it wasn't to be for the champion after Cena finally managed to put his man away with the attitude adjuster for the title-winning pin. That wasn't the end of things though. As Cena celebrated his title win Rollins grabbed his other title belt and tried to head for the hills. Cena blocked his path and refused to let him by before taking him down with an attitude adjuster on the floor and pushing him back into the ring. 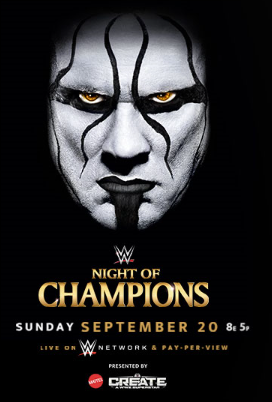 Then it was straight on to the main event with Sting challenging Seth Rollins for the WWE World title. Well, unless you've been living in a cave for the past week you'll know what happened in this one. It began well enough. Sting dominated the early going against his somewhat groggy opponent, and all seemed to go well for him until he took the champion up onto the announcer's table. It was then that he took his first big bump when Rollins pushed him back and Sting went through the Spanish guy's table. From there the match developed into a good back and forth encounter. Both guys had their moments, and the Stinger looked pretty good as he turned back the clock and took it to the young upstart. Then it happened. As Sting was standing on the second rope delivering a series of blows Rollins grabbed his legs and carried him across the ring before delivering the second turnbuckle bomb of the match. The damage had been done. They continued with the match for the next couple of moments, but when Sting collapsed after coming off the ropes the referee called the doctor in to check the challenger over. With what we know now it probably would have been best to wave the match off there and then, but after a few moments of consultation the match re-started. All of this meant that the finish was brought forward a few minutes. Sting countered Rollins' pedigree attempt with the scorpion deathlock, and after Rollins reached the ropes Sting pulled him back into the ring. Rollins landed on his feet though and connected with a kick to the back of the head, but this didn't stop the Stinger from going for the deathlock again. The second time wasn't a charm though as Rollins rolled him up for the title-retaining three count. But the champion's night was far from over. As Sting was being helped to the back Sheamus came racing down to the ring, intent on cashing in his Money in the Bank contract after he took Rollins down with a brogue kick. He never got the chance because another interloper, the demon Kane, arrived on the scene and took Rollins out with a chokeslam. Sheamus then urged the Big Red Machine on, trying to get him to take him down with another chokeslam. Kane was having none of it and took the Irishman down with the chokeslam instead before leaving Rollins laying after a tombstone piledriver, with the lights turning blood red as the show reached came to an end. In conclusion - well, I may have been delayed a little by some on-going health problems but I'm glad I finally got round to watching this show, because it was a very good show. All of the matches, from Kevin Owen's first title win in the opener right through to the brilliant efforts of Seth Rollins delivered. Even the never-ending saga of Rusev and Ziggler was enjoyable. As for my match of the night no-prize I'll have to go for John Cena and Seth Rollins again. Their quality encounter was the perfect set-up for the main event. It was just sad to see that match play out the way it did. Hopefully this won't be the last we'll see of the Stinger. So with all of that out of the way there's just one more thing left to do, and that's to give this year's Night of Champions the thumbs up.